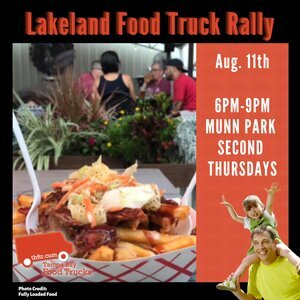 Join us in Downtown Lakeland for our monthly rally! Luckily, the second Thursday of the month falls on Valentine's Day so we're here to help you celebrate! We will be making this rally extra special with tables, linens, chairs, centerpieces, and the love truck (also known as the mobile DJ truck). Check out all the lovely food trucks to choose from below. Bring your date, your dog, or your friends for a night to never forget! The Chicks Coop, Jimmy’s Famous Seafood Express, Mac Shack, Manolito’s Cubans, The Rolling Gourmet, Tallulah’s Table by the Sea, Sawadee Thai Food, Off the Griddle, Spontaneous Consumption, Got Candy and More, Jazzy B Grille, Big Bang BBQ, Anju Korean Gastrotruck, Down Home Southern, Open Fire Grilled Brazilian, Melt Machine, Vietnamese Food Truck, Froyo to Go, and Craving Donuts will all be there!